This week, Your News to Know rounds up the latest news stories involving gold and the overall economy. Stories include: Trump says gold standard would make America great again, gold’s strong start to 2016 could get even better, and gold demand in key market just went up 82%. Some of Trump’s recent statements at CPAC regarding the dollar and gold made many – including Forbes contributor Ralph Benko – wonder what the President meant. Among his comments, Trump said that there is no such thing as a global currency. But Benko argues that the dollar currently fills that burdening role. When the Nixon administration abolished the gold standard, the dollar’s privilege of being the international reserve currency became a liability. If Trump wishes to fix this situation, he has three options: (1) keep the dollar in its current position, (2) push for the IMF to become a world central bank or (3) adopt a modernized gold standard. 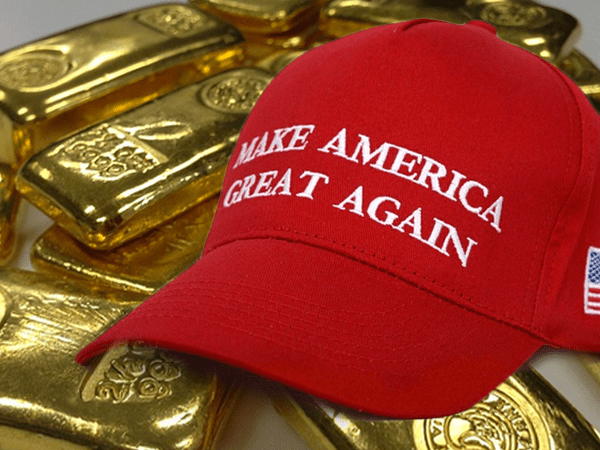 According to Benko, the third option – along with elimination of tax and regulatory barriers to the use of gold as a currency – is the only one that goes with Trump’s political statements and economic growth plans. Trump has already shown an affinity for the gold standard. In an interview with WMUR television, he said, “We used to have a very, very solid country because it was based on a gold standard.” He repeated the sentiment to GQ, saying, “Bringing back the gold standard would be very hard to do, but boy, would it be wonderful. We’d have a standard on which to base our money.” Yet Benko notes that Trump erroneously believes America doesn’t have enough gold to restore a gold standard. In fact, the U.S. has more gold than Germany and the IMF combined, and the three have more than the rest of the world combined. Benko believes that restoring gold as the primary global currency – along with filling vacant Federal Reserve Board spots with key people who understand the yellow metal’s significance – would bring back the unparalleled economic prosperity of the U.S. that followed World War II. To support his point, he quotes Alan Greenspan’s recent reveal: the Great Moderation under President Clinton, which saw the creation of 20 million jobs and the conversion of federal deficit into a surplus, was fueled by U.S. monetary policy following signals that a gold standard would have created. Gold finished February higher than it did in January, which secured the metal’s second straight month in the green. The last time it logged such a streak was the summer of 2016, when tensions ran high amid the U.S. presidential campaigns and Britain voting to leave the EU. “We really see this as heightened geopolitical risk,” said Erin Gibbs, equity chief investment officer at S&P Global. Gibbs told CNBC that there are plenty of reasons falling out of current events for people to turn to gold for security, including the upcoming French election (which brings the possibility of a ‘Frexit’), the German election in the fall and the recent weakening of the U.S. dollar. According to Bank of America Merrill Lynch forecasts, gold will rise to $1,400 by the fourth quarter of 2017. A recent report by foreign exchange strategist David Woo states that negative yielding bonds have made gold more attractive – since interest rates and the price of gold tend to move inversely, more flows into these bonds would cause gold to rise further. Miller Tabak is also optimistic on the metal: its equity strategist, Matt Maley, noted that gold breaking above a key technical level of $1,250 is a positive signal that could send gold to the $1,300 mark “relatively quick”. India’s gold demand made a lot of headlines last year, as the world’s former top importer of gold saw a 21% fall in shipments. Last week’s news, however, suggests that the country’s gold demand is coming back to life for the first time in nearly a year. Preliminary statistics on India’s gold imports in February show a major lift; GFMS estimates that India brought in 50 tons of bullion last month, up 82% from the 27.4 tons imported in February of 2016. OilPrice.com’s Dave Forest notes that India breaking away from its import lows from the previous months makes sense – various factors that weighed on demand are no longer an issue. Aside from a jeweler’s strike, there was also the cash crunch triggered by demonetization of small bank notes that started in November and lasted until January this year. Forest also says that Indian buyers, who might have held out in hopes of lower prices, are now returning to the market after realizing that gold’s higher prices as of late are here to stay.